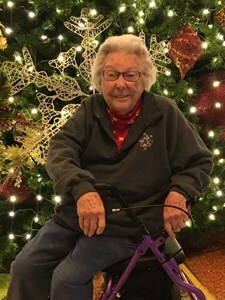 Gertrude S. Reed, 92, recently of Olathe, KS, passed away on April 9, 2019. She was born on November 14, 1926 to William Kraus and Gertrude (Conley) Kraus in LaGrange, IL. On April 9, 1946, Gertrude married Merwyn Reed. Gertrude and Merwyn had five children together, Patrick, Jackie, James, Teresa and Debra. She was a military wife, living in several states as well as Japan and Germany. She loved Traveling and took every opportunity to see Europe. As an Avid bowler, she was able to travel all over the country representing Manhattan bowling leagues. She was also a volunteer at Mercy Hospital for 30 years, and she enjoyed crocheting and making blankets that she donated to churches and hospitals. Gertrude is survived by her loving children, Patrick, Jackie, Teresa, and Debra; four grandchildren; eight great grandchildren; and one great great grandchild. She was preceded in death by her husband, Merwyn; son, James; granddaughter, Cynthia; and her great grandchild, Cooper. A Memorial Service will be held at St Thomas More Catholic Church in Manhattan, KS on April 23, 2019 at 11:00am. In lieu of flowers, memorial contributions may be given to either the American Red Cross or to the American Diabetes Association. To leave a special message for her family or to share a memory of Gertrude, please click on the "Share Memories" tab above or scroll down below. Add your memories to the guest book of Gertrude Reed. Thinking of you all at this sad time. Fond memories of her and your family.